Habitat: Various types of bodies of water. kroko="pebble," deilos="worm (or man)," niloticus="of the Nile River"
Length: Typically up to roughly 16 feet, reports exist of specimens over 20 feet long. Food: Primarily fish and small animals, but capable of bringing down large mammals including man. Range: Sub-Saharan Africa; Madagascar. I observed this crocodile on a fairly cool (about 60 degrees Fahrenheit) day. I estimate the length at 10-12 feet. Initially it was swimming across on open area of the waterhole, but later turned and headed for the shoreline, where it apparently snacked on a fish (couldn't tell if the crocodile caught it or happened upon a dead one). The picture is a still from my video camera, captured at the moment the croc threw a small piece of fish into the air and gulped it down. 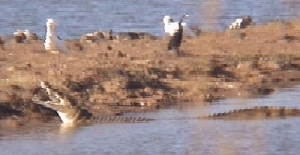 The piece of fish appears as an oblong dark shape between the croc's jaws.